I guess I've always liked fullblown popsongs with orchestral backings. 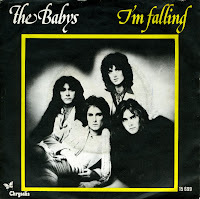 'I'm falling' is a good example of this: a strong popsong with beautiful music performed by a fullblown orchestra. The Babys didn't have a lot of success with this song, though: it didn't chart in the Netherlands. I was too young to buy it in 1978 - not getting enough pocket money to buy all the good music that was around back then. Fortunately, in 1987 I did find it - and at a good price, too.